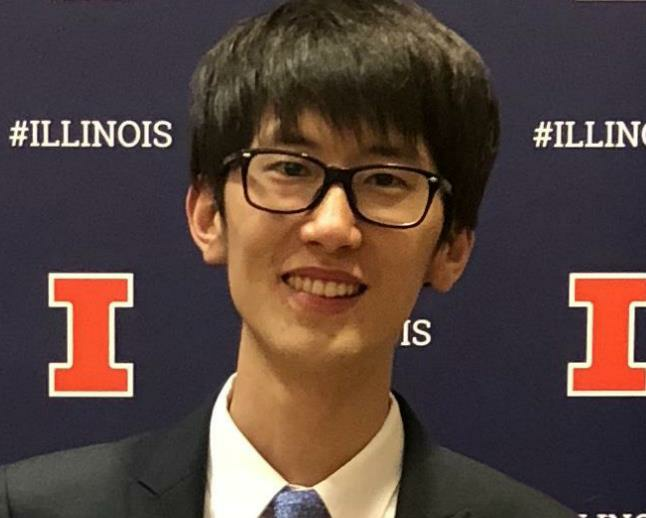 The Micro and Nanotechnology Lab (MNTL) recently profiled ECE ILLINOIS graduate student Hsuan-Ping Lee, the 2017-18 recipient of the E. A. Reid Fellowship. In 1983, Mrs. Nell W. Reid established the E. A. Reid Fellowship in honor of her husband, who taught in the Department of Electrical and Computer Engineering from 1917 to 1956. The fund was set up to encourage graduate students pursuing a PhD to consider an academic career. Applicants are assessed against criteria including a high level of academic performance, research accomplishments, and a demonstrated interest in engineering education activities. It was the donor's desire that "deserving students interested in pursuing a course of study resulting in the teaching of electrical engineering" be given preference. Fellowships generally indicate a high level of advanced scholarship, and this is the case with Hsuan-Ping Lee. When Lee completes his PhD program, he's looking forward to devoting his career to advanced semiconductor technology. Prior to beginning his studies at the University of Illinois, Lee earned his bachelor's and master's degrees in Taiwan. The U of I has a worldwide reputation of prominence in engineering. In particular, the Department of Electrical and Computer Engineering is a place where excellent research results are produced by hard work and critical thinking. I would also like to say that I really enjoy my life at Illinois-it’s challenging and rewarding at the same time! When will you graduate from Illinois? The plan is to finish my PhD in May 2019, which means I have only two more semesters to fulfill my research goal. Share a little bit about your research focus, and why you are drawn to this area of research. My research focuses on high-speed GaN-based transistors integrated on silicon substrates, and the goal is to benefit 5G wireless communication technology. I practically design, fabricate, and characterize my devices, and currently I am working on improving the quality of heterojunction interface in my devices. To me, it is very exciting to work on such a leading-edge technology and it feels rewarding after solving problems and conquering challenges. What is the name of the research group that you are a part of? What is working with this research group like? I am from ECE ILLINOIS Professor Can Bayram's group, ICORLAB (Innovative Compound Semiconductor Laboratory). Our group values motivated students who are expected to become great scientists or engineers capable of independently conducting research and solving scientific problems in the future. Hard work and critical thinking are the two mottos that Professor Bayram wants us to keep in mind. Our group members currently all work on GaN-related projects, including material characterization, theoretical simulation/calculation, and device fabrication/analysis. When did you receive the Ernest A. Reid Fellowship Award? What were your thoughts when you learned that you had received this award? It was in March 2018 when I was informed that I was awarded with this great honor, and I was really thrilled, almost couldn’t believe it in the first place. It is a great honor to be awarded with the Ernest A. Reid Fellowship; it recognizes the effort I devoted to both undergrad teaching and graduate research. I really appreciate it. I look forward to devoting my future work to the field of advanced semiconductor technology! Read the original article on the MNTL website.